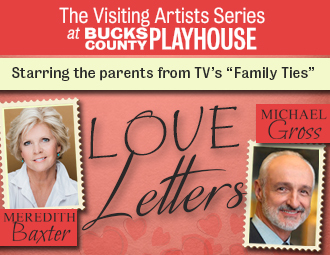 Mar 12 Conference Call: Meredith Baxter and Michael Gross: "Love Letters" at Bucks County Playhouse + "Family Ties"
Meredith Baxter and Michael Gross as "Elyse and "Steven Keaton" on NBC's "Family Ties"
Meredith Baxter & Michael Gross Interview Excerpt...Full Interview Below! From 1982-1989, my family & I watched Family Ties every week. I adored that show. Some of my favorite episodes were when "Alex" takes speed pills, "Elyse" develops a gambling addiction while in Atlantic City, "Steven" takes "Jennifer" to her Sunflower Girls meeting, "Andy" befriends a deaf student in his preschool class, "Alex" and "Ellen's" whole story line, "Nick" meets "The Keatons," "Steven" has his heart attack (which was the first thing I thought of when my dad had his triple bypass surgery a few years ago), "Elyse" and "Alex" take an automotive class together, and of course the series finale when "Alex" moves to New York. I am just over the moon that I got the chance to interview two of my idols growing up. Not only did I watch Meredith Baxter & Michael Gross on Family Ties, I watched many of their TV movies, guest starring roles on other TV shows, and films. This April, Meredith & Michael are making their Bucks County Playhouse debut in A.R. Gurney's Love Letters (which they have previously performed together numerous times). In Love Letters, when "Andrew" accepts an invitation to "Melissa’s" birthday party, and "Melissa" writes a thank-you note, a romantic friendship and correspondence is born that will last more than 50 years! Though their relationship constantly changes, these pen pals remain each other’s most trusted confidantes. A touching romance through old-fashioned pen and paper, Love Letters is a disarmingly funny and unforgettably emotional portrait about the powerful connection of love. Love Letters will be performed at Bucks County Playhouse in New Hope, PA (70 S. Main Street) from April 4-8. Click here for tickets! For more on Bucks County Playhouse visit http://bcptheater.org and follow them on Facebook, Twitter, and Instagram! For more on Michael, follow him on Facebook and Twitter! 1. This April, you are making your Bucks County Playhouse debut in A.R. Gurney's Love Letters. What excites you about making your Bucks County Playhouse debut? Meredith Baxter: I've performed at the Pocono Playhouse previously and I love the area. I'm excited to return to the area and perform this play with Michael again, who is just one of the dearest people in my life. Michael Gross: There are multiple things. Any chance I get to go East, particularly to parts I have not seen is always fun for me. I hear New Hope is gorgeous and that the Playhouse is just terrific, so I'm looking forward to that. I'm most excited to do this play with Meredith again. We've done it a number of times together and it's always good to keep it fresh. It's always a little different because we bring different things to it each time we do the play. 2. You both have performed this show together prior to this upcoming production. Why do you like performing this play? Meredith Baxter: I think it's a really rich play. I love that it's two characters. I think the idea that we are sitting side by side and don't react to each other is very interesting and compelling because what the audience gets is they don't get our physicality; they get our words, they get our facial expressions and our body as it sits there behind a desk. We can channel a lot of information into our face and our arms and our voice and we give a lot of information that way. Meredith Baxter as "Melissa" in a previous production of A.R. Gurney's "Love Letters"
3. What parts of your personal friendship and longstanding working relationship do you bring to your performance in this show? Meredith Baxter: If you know the play, it's two characters whose life's span almost 50 years together. Michael & I have known each other over 30 years, since 1982. That's a long time. Our friendship was a profoundly deep and meaningful relationship to me when we worked together on Family Ties. He was my best friend during that time. Well, the whole cast was. We were very close. We just adored each other. There was a wonderful sense of respect among the cast and what we all brought to the table and we appreciated the timing and intelligence behind everyone's choices. We were working with these incredible writers who gave us these great words we got to say. In terms of Love Letters, it's hard to fault those words too. There's so much humor in the play. I don't want to call it a comedy or a drama because it's rich with both. When you know each other that well, you know from a sign that is coming two feet away from me, like he is in the play, I kind of know what he's doing. From the squeak of his chair, I know he's moving back or I bet he has this kind of look on his face. I appreciate that. He's such a strong performer. He pulls on a reservoir of everything that has informed him his entire career. He's got great reserves of humor, intelligence, and a depth of history & understanding. He's played a lot of characters that he can pull into the part of "Andy," which is really sweet. I feel like I get the benefit of all that. Michael Gross: I do think after so many years of knowing each other there is a kind of shorthand we share. We know each other's best habits and bad habits and can call each other out on them. There's a familiarity between us where we can talk frankly to each other, what we think is right, what we think is wrong, how we can do this better. We know how each other works, which is really really helpful. 4. What do you identify most about "Melissa" and "Andrew," respectively? Meredith Baxter: Her unhappy childhood. I don't want to give too much away about the character, but she has certain things that she has struggled with that I have struggled with in my life. I think we are drawn to people who have similar pain, similar damage. I feel in many ways "Melissa" and I did too. I like walking around in her world. and I feel there are so many answers, had they been available to her, that she would have been able to pull herself away from all the damage, all the choices she was making. Michael Gross: These two characters are very different people, but they are soulmates. Most see soulmates as people who are just like them, but a soulmate can also be seen as people who are somewhat different from you, but fill those gaps you don't have in your personality. That's why I think "Melissa" & "Andrew" are together for so long because they need each other. They complete each other. Just a little introduction to what I think is different. "Melissa" is a person who is incautious. She jumps into things. She lets her emotions rule her. "Andrew" is a person who is far more cautious. He lets his head rule. He would say, "Look before you leap." She would say, "He who hesitates is lost." They are both right in some ways. He supplies a kind of caution she could use more of and she supplies a kind of exuberant life spirit he could use more of. I certainly have parts of both in me. I'll jump off and hold my nose for some things and other things, I’m so cautious to the point of paralysis. 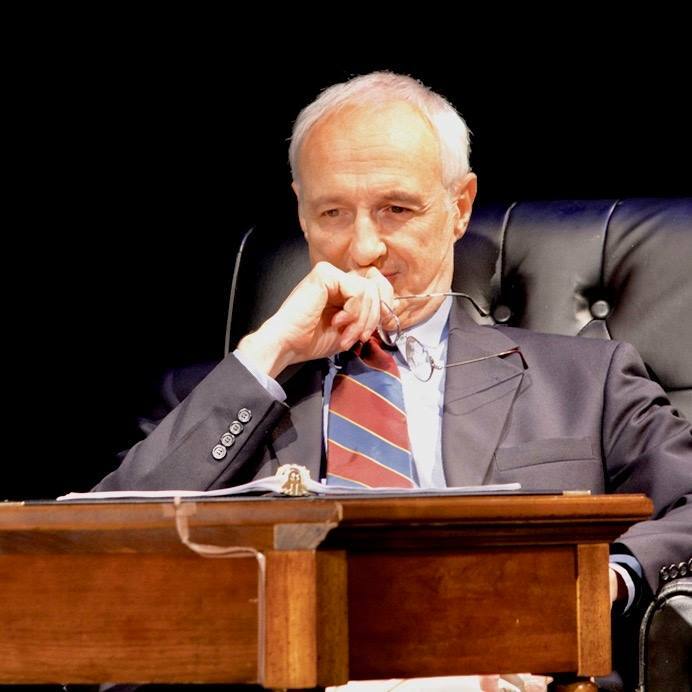 Michael Gross as "Andrew" in a previous production of A.R. Gurney's "Love Letters"
5. What is one characteristic of theirs you are glad you yourself don't possess? Meredith Baxter: The irredeemableness of herself. I think there is no way she can picture life getting better. Michael Gross: I think his greatest worry is about what people think of him. He has a certain amount to protect. I'm glad I don't share that aspect with him. "Melissa" on the other hand doesn't give a crap what people think and I feel I share that with her. 6. In Love Letters, "Melissa" & "Andrew" discuss their hopes and ambitions, dreams and disappointments, victories and defeats – that have passed between them throughout their separated lives. What hopes and ambitions do you still want to achieve? Meredith Baxter: I'm living in Santa Barbara now, where I've been for a year and a half. I just finished the run of a play here that was so much fun to do called The City of Conversation. I worked with Sharon Lawrence who was just magnificent. She was wonderful. In conversations with her, I came to understand, I want to be more of a participant in the theatre and bring people to theatre. So, I'm meeting up with a couple of theatres in town to see how I can get involved. Michael Gross: This is more like a psychiatry session with you. Hopes and dreams shouldn't ever quite end. There's still some writing I'd like to do. Some auto-biographical, some fiction. I still look forward to finding great material to act. When I was younger I would do whatever I could to keep my name out there and get the work, but as you get older, you do realize your time is finite, so now I would rather spend more time with family and friends, then take every project that comes my way. 7. What has been your biggest disappointment either personally or career wise? Meredith Baxter: I don't know that I have any disappointments. I've got a good life. Michael Gross: In terms of the career, I think once upon a time I could have had a shot at a feature film career, but there were some things that went slightly awry where I didn't always have an opportunity to get seen. Sometimes I'm disappointed that hasn't worked out to a better degree. But having said that, I just did a fantastic feature film with Disney a few months ago, so it happens, I just wish it would happen more often. In terms of disappointments personally, I think it's the times I was irresponsible and hurting other people, particularly when I was young man. I didn't know what I wanted. I was falling in and out of love multiple times, breaking hearts in spite of myself. I didn't want to break hearts, I just didn't know who the hell I was or what I wanted. I think of that. Some of that is hard to forgive myself for. I think about certain people I hurt. If I could track them down, I would. Maybe in this day and age of Facebook, I could. I'd love to say to them, "By the way what happened 40 years ago, I'm sorry about that." 8. What do you feel has been your greatest victory? Meredith Baxter: That I'm still acting. Women don't have long careers after a certain time. Men's careers don't seem to slow down that much. Women's certainly do. I think there's a certain inequity in that. I think you should do something to change that. Michael Gross: Keeping my marriage together for almost 35 years. It was/is my first marriage. I married late because I don't think I was quite equipped for it earlier in life. But after all that muddle and confusion, I finally settled down. I definitely chose the right person. 7. I can't do an interview with you and not ask about Family Ties, one of my all-time favorite TV shows. Has there been any talk about a Family Ties reboot? Meredith Baxter: No there has not. Too much time has passed. Plus we lost our beloved creator Gary David Goldberg in 2013. Michael Gross: There is no talk and I very much doubt that will happen. You know our head guru, Gary David Goldberg has passed away, the man who really was at the heart and soul of our show. There is not a lot of interest from our original writers. They've have gone on to do other things. For example, the Disney feature I did was with one of our head writers, Marc Lawrence. He wrote Miss Congeniality. Another one of writers did King of Queens for almost 9 years. I've been busy with "Burt Gummer" in Tremors, which we are coming out with the 6th installment of that film May 1. I think it's best left the way we remember them...fondly. Meredith Baxter has been an actress for 47 years; she’s also a writer, artist and mother of five, grandmother of three. She has starred in four series, including the long-running Family Ties. She’s been nominated for four Emmys, and made about sixty movies for television, among them Betty Broderick: A Woman Scorned. She’s been in a smattering of plays: Butterflies Are Free, Vanities, Country Wife, toured with Talley’s Folly, Diaries of Adam and Eve and about 30 different productions of Love Letters around the country. Meredith’s New York Times bestselling book, UNTIED, a Memoir of Fame, Family and Floundering, was published in March, 2011. Meredith has performed with Speaking of Stories at Santa Barbara’s Center Stage, and recently she and Michael Gross gave a fundraiser for them with performances of Love Letters. She is a speaker on issues as diverse as alcohol abuse, domestic abuse, breast cancer, abortion rights, and LGBT issues. Aging gracefully with purpose, she just might be writing and speaking about that, too. Baxter lives in Santa Barbara, California, with her wife, Nancy Locke. Michael Gross, perhaps best known for his portrayal of father "Steven Keaton" on NBC’s award-winning Family Ties, has portrayed a remarkable range of characters during his forty-year career as an actor, including recurring roles on The Drew Cary Show, ER, How I Met Your Mother, USA Network’s Suits, Netflix’s Grace and Frankie, and was a recurring character in two Canadian series, Call Me Fitz and The Stanley Dynamic. He has starred in dozens of television films, guest-starred in numerous television series, and was a series regular on the number one-rated daytime drama, The Young and the Restless. He has appeared on the Broadway stage, in numerous regional theatres, and was the recipient of the Obie Award for his Off-Broadway theatre work. On the big screen, Michael enjoys cult status among sci-fi and horror movie fans for his portrayal of survivalist "Burt Gummer" in the feature film Tremors, its five sequels, and its Sci-Fi Channel series. He has appeared with Ali McGraw in director Sidney Lumet’s Just Tell Me What You Want, played opposite Lily Tomlin in Big Business, with actor Lucas Haas in the award-winning Alan and Naomi, and with Wynona Ryder in Stay Cool. More recently, he was honored at multiple film festivals for his title role in the award winning short film, Our Father. His current projects include a recurring role on The Affair for Showtime, a guest star role on television’s new AP Bio, the feature film release of Camp Cool Kids, the DVD and on-demand release of Last Call At Murray’s; and the reprise of his role as “Burt Gummer” in Tremors 6, to be released by NBC Universal in May, 2018. He is currently working as an exceptionally large elf on a new Disney feature for the 2019 holidays. Michael is a graduate of the University of Illinois at Chicago and the School of Drama at Yale University in New Haven, Connecticut. He and his wife, former casting director Elza Bergeron have been married for thirty-plus years, with two children and two grandchildren. He is the recipient of the American Hero Award for his charitable activities. Mar 9 Call Answered: Lisa Linke: Amazon's "Successful People", Netflix's "LOVE", + "Rick & Len Fix Sh!t In Your House"